What makes the super-premium wine region of Priorat stand out aesthetically in Spain is the vineyards are located within a pristinely beautiful national park. The scenery in fact resembles the Douro Valley for its steep terraced vineyards. Cult wines abound here and collectors will have heard of the mythical wines from Clos de l´Obac (Costers del Siurana), Mas Doix (one of Spain’s few wine estates to get 100 Parker points), Clos Erasmus, Clos Mogador, and of course the venerable Álvaro Palacios whose L´Ermita wine is one of Spain’s most expensive and appreciated. Priorat’s flagship grape is Grenache, called Garnacha Tinta, and this region has an impressive amount of old vines which help create rich, concentrated, velvety reds. The unique slate soil, Llicorella, has to be seen and touched to believe, very special. 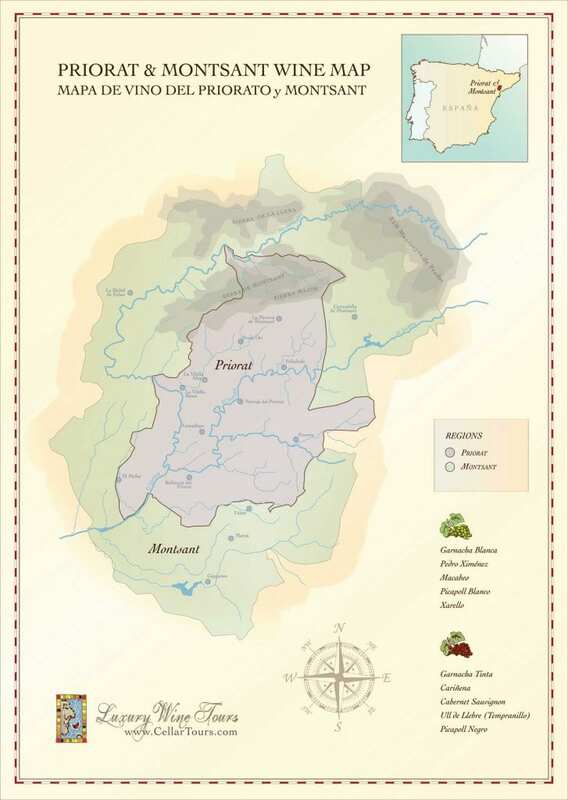 The symbol of Priorat is the 11th century Cartoixa, located in the adorable medieval hamlet of Scala Dei. Top class olive oil is also made here. Located two hours south of Barcelona, a Priorat Wine Tour is a viable day excursion or indeed, a lovely destination to spend a few days exploring the region deeply, read more in our section on the Priorat region. Embed Priorat & Montsant Wine Regions Map on your site: copy and paste the code below.